Nigerian Beef Suya is a popular street delicacy enjoyed by everyone. 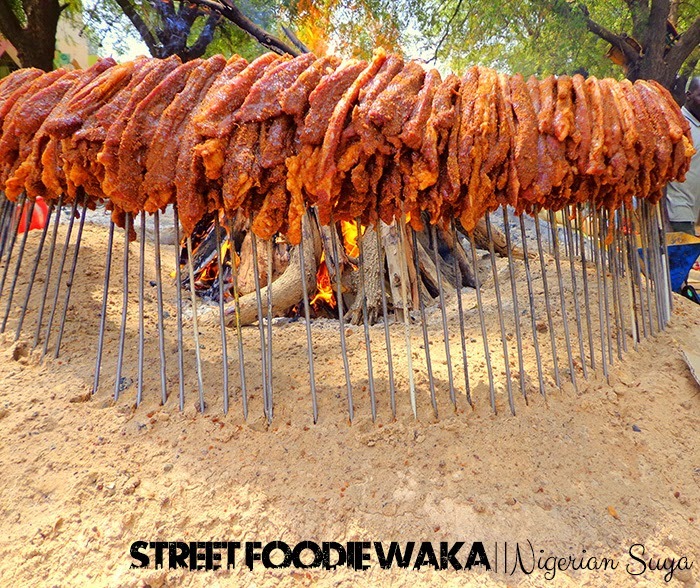 To describe it in layman’s terms, it is simply barbecued skewered meat prepared with a special spice known as suya spice. Originally from the Northern part of Nigeria, “Suya” has now been adopted as a main staple across Nigeria. The secret to this popular meal has a lot to do with the specially prepared spice which is usually coated around the meat before roasting on the barbecue grill. Suya spice is made from a mixture of different ingredients which includes pepper, groundnuts and a host of others. During my street foodie waka through the North, i also noticed to my amazement that it’s sometimes prepared in open flame as shown in the pictures. i had never seen it done in open flame before that day and my curiosity got the better part of me. Though i couldn’t speak Hausa language, i was able to get the ingredients from the “mai suya” by going through the Hausa-English conversion Language book i was given at the camp :D. It could be made with beef, chicken, ram or Inner parts such as kidney, liver and tripe (Sharki). Step 2:The next step is to extract the groundnut oil because what you’d need is the paste. To do it locally, Place the peeled peanuts in a dry mill and grind into a paste. Add a little hot water and pour the paste through a pap sieve. Squeeze the paste and gradually the oil would begin to come out leaving the groundnut cake behind in the sieve. This is then left to dry a little before frying. Step 4: Drizzle with vegetable oil and place on the barbecue grill. In the north, Suya is sometimes prepared in open flame. Step 5: Once in a while, brush some more vegetable oil over the meat to prevent it from burning and drying up. Serve with chopped chunks of Raw onion, Tomatoes or Cucumber.